Hikers can still enjoy the great outdoors during hunting season, you just have to be a little more cautious and know a few rules before you go! 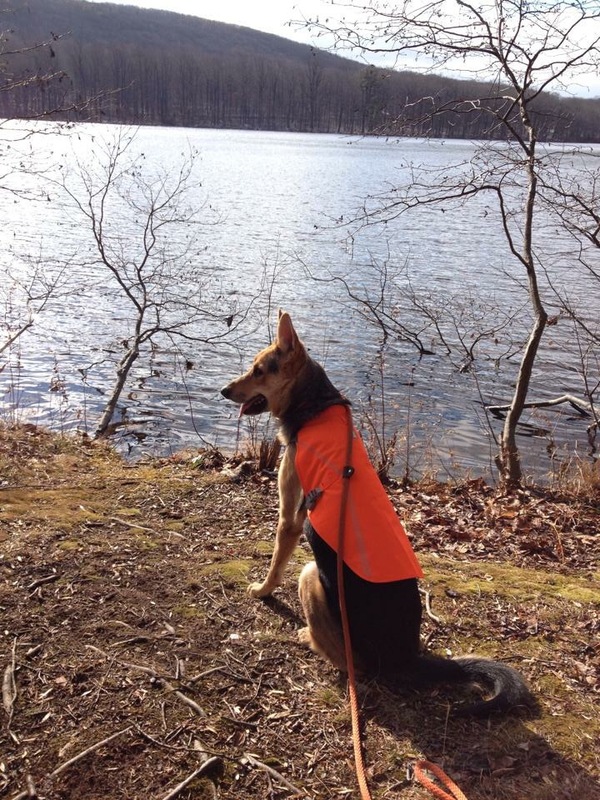 ALWAYS WEAR BRIGHT ORANGE – here in PA during hunting season it is required that everyone passing through state game lands wear 250 square inches of fluorescent orange. The reason for this is that it is not a color that occurs naturally in the wild. You want to stay away from colors that are earth tones such as browns and greens – it is even suggested that you don’t wear white as it can be mistaken for the tail of a deer. You should also be able to see the orange from every side – for example don’t just wear something over your pack as then there is no visible orange from the front – the most common thing is a fluorescent orange hat. There are also vests you can get. I have an orange hat, plus orange pack cover and a bright pink jacket. 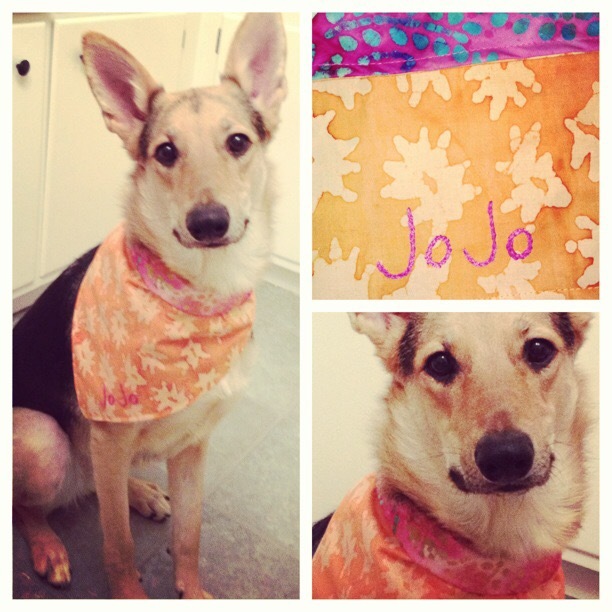 JoJo has a reversible orange bandana I made for her – it even has her name embroidered on it – oh yeah, I’m crafty like that! She wears this most of the year actually as I just prefer for her to have something on that makes her more visible. 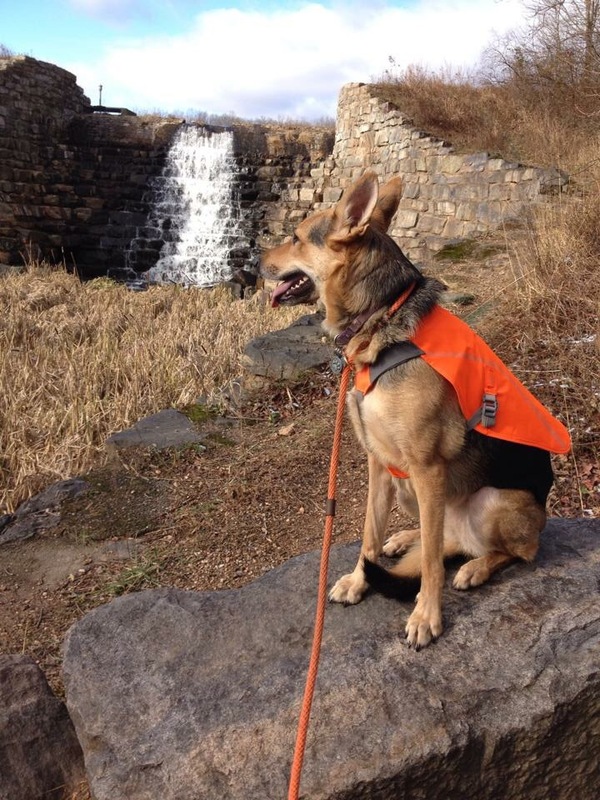 She also has the Ruffwear track jacket which fits her perfectly, and the Ruffwear Headwater collar which are both bright orange. It is MY job to keep her safe while out on the trails! Be Aware – know what the different hunting seasons are and WHEN they are – before I met Kevin I had no idea that there was archery, small game, rifle, trapping, muzzleloader, etc. This is all very confusing to someone who is not into hunting. I used to think hunters just went into the woods in fall and winter and had free range to just blast away whenever/ wherever they wanted – not so. They have to get permits and there is really only a few weekends for rifle in our area, but check with the laws in your state – there are plenty of resources online! 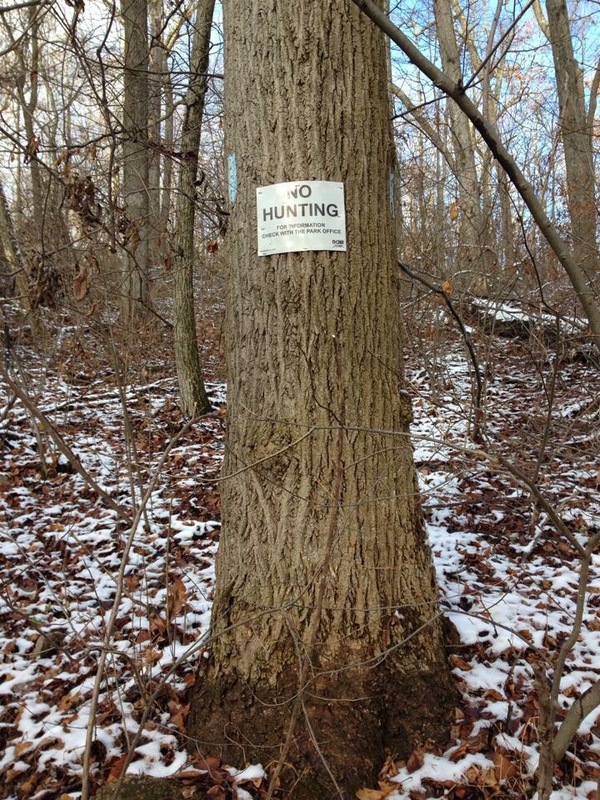 Hunters are also expected to know where hiking trails are and if they are aloud to hunt next to them. I used to think “why would a hunter WANT to hunt next to a hiking trail? Wouldn’t the hikers scare all the deer away?” but Kevin explained that animals also use those trails. Hunters are expected to make their presence known to hikers walking by and only shoot when they are SURE of their target, just as hikers are supposed to talk or make a little noise to let hunters know they are approaching. They will most likely see you before you see them. Hunters will be most active during dawn and dusk – know where hunters like to set up and try to avoid those areas and stick to the blazed trails. Do NOT Interfere – just as we have every right to go into the woods and hike around, they have have every right to hunt – they also have to PAY to do this. While I am a HUGE animal lover and can’t stand the thought of harming any animal, I also have respect for most hunters. Kevin and his family are very respectful of the animals they kill and they eat the meat. I have a lot of respect for people like this as they know an animal died for them to eat. They have been NOTHING but accepting of me and my vegetarian, slightly hippie ways (but that’s a different story I suppose!). So please do not go crashing around screaming to scare away whatever it is they are hunting – interference and harassment is actually illegal in PA. Believe me people do actually do this, it is not a happy outcome and creates a lot of problems. Even after doing a lot of research it can still be confusing – I was hiking on a trail during hunting season and going up a steep switchback, the trees on my left said NO HUNTING and the trees on the right said ONLY SHOTGUN MUZZLELOADER ARCHERY HUNTING PERMITTED. So what the heck does that mean? 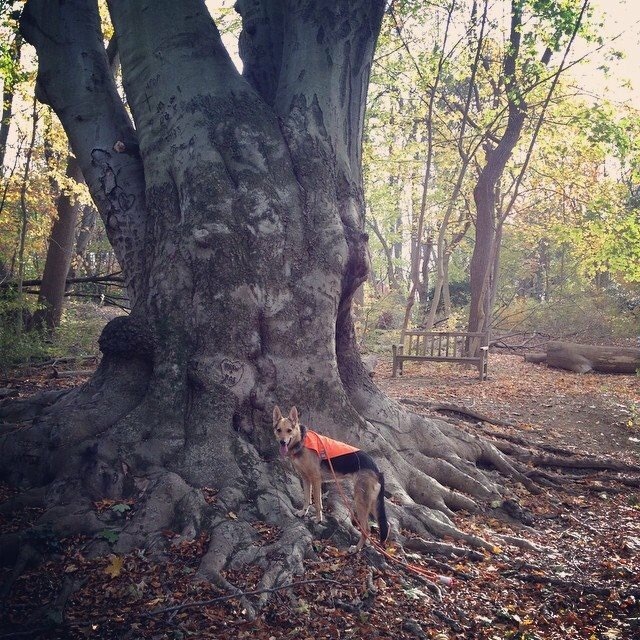 As we zigzagged up the hill it seemed like one second there was no hunting allowed and the next all hunting was allowed – plus the map we had stated NO HUNTING in the area we were hiking which is why we chose that trail! I believe the trail cut through 2 areas of the park we were hiking in, but why would someone want to hunt in the narrow switchback? This did make us extremely nervous, but we didn’t see a hunter the entire time we were there. Some places allow hunting in some sections and not others – and hopefully their maps are correct! 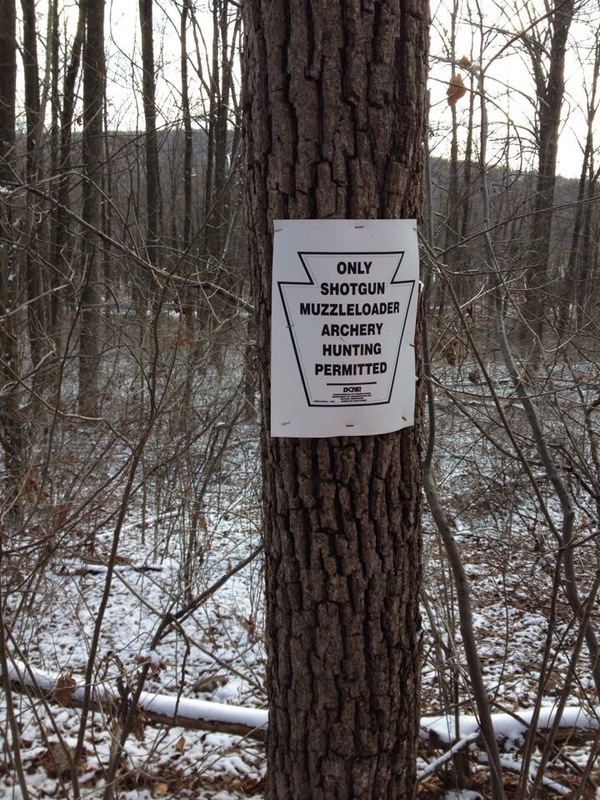 If you are still worried about running into hunters in the woods, you can always hike on Sundays in PA as it is illegal to hunt on a Sunday! I love that you put a bright bandanna on the pooch! Good thinking! stay safe out there!